When George Bolton returns home to Devon at the end of the war, Rita assumes that her childhood sweetheart will marry her and that their future will be a reassuring continuation of their past. But the boy who joined the RAF has returned a man, and a man irrevocably changed by the horrors that he has seen. Unable to settle back into the sleepy country routine, George resolves to spend a year on the family farm in Argentina, and, despite her disappointment, Rita promises to wait for him. Before he has even landed on Argentine soil, George has fallen in love with someone else, a woman who seems to soothe his troubled soul. He marries Susan even though he knows it will break Rita’s heart and, thousands of miles away, can avoid the consequences of his decision. While he is away, Max de Guinzberg, the young Jewish refugee adopted by Rita’s eccentric grandmother, grows up. Tormented by the tragedy of his past, he finds solace in Rita, whom he has loved for as long as he can remember. But her heart still belongs to George. When his father dies, George returns to Frognal Point to find he must revisit the past. Reawakened by his abiding love of the Devon countryside, memories of that youthful innocence return and George finds himself tempted by another agonising choice. Crafted in the lush beauty of rural Devon, tempered in the scorching heat of the Argentine sun, The Swallow & The Hummingbird is a passionate romance in the grand tradition. With a cast of unforgettable characters, and a fond eye for the comedy – as well as the tragedy – of life, it will win Santa Montefiore a wealth of new readers. 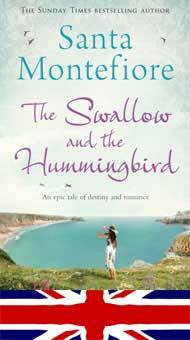 The Swallow & The Hummingbird was the last of my ‘Latin American quartet’. By this time my novels were doing very well in Europe, selling especially well in France, Germany and Holland. Much to my surprise and disappointment, the USA were not interested in Argentina and Chile and no one wanted to publish me out there. This was also the last of my sagas. In a successful bid to win America I changed direction with my next book. For this one, though, I based the largest part of the book in Devon with a few chapters in Cordoba, north Argentina. When I lived there we stayed with a friend who had a beautiful ranch in the hills. We rode out with the gauchos across rugged countryside and watched eagles circle high above us. I thought this would be a good place to base the book, having explored the flat Argentine pampa, the cool Chilean coast and the English Colony in Buenos Aires in the previous three. This hilly terrain was a different part of Latin America that had captured my imagination. I make up all my own locations. This is partly because I enjoy inventing places. I like to decide where the village church goes in relation to the main house, where the shop and pub are and how far it is from the sea. I like to invent names and local characters and of course the history, which is the main reason I make places up. If I use real towns and villages there will inevitably be a reader who complains that I have got the history wrong, that a bomb did not fall on the church in the war, or that on 9th May 1958 the pub did not burn down. Fictitious locations avoid uncomfortable replies to indignant readers! For this novel, about a fighter pilot in the Second World War, I read a couple of autobiographies written by war veterans. They were fascinating as well as enlightening. While I was deliberating the plot I went for a walk in the woods where I grew up in Hampshire, and watched the pheasants and partridges. I thought about the way they are shot down and how some get back on their feet again and manage to fly while others just sit there looking terrified. This made me think of people I know who react to life’s struggles in the same way. What makes one person sit in a heap while the other draws on some hidden inner resource and pushes on? I used the analogy of the two wounded birds, hence the title. One is English, the other American. I thought it fitting also that as the hero is a fighter pilot, the theme should be about flight. I might add that I began the novel with one of my most important characters, Mrs Megalith, and needed her to be talking to someone. So I created Max. Max wasn’t meant to have such a large part, he was simply there to enable me to introduce Mrs Megalith. George is the hero, after all. But I so enjoyed him that he ended up taking over. When writers say their characters sometimes take on lives of their own, I think that is what they mean! Mrs Megalith stared down at the body and sighed heavily. What an unsavoury sight first thing in the morning. It was rigid and cold and looked like something one of her grandchildren might have made at school out of papier-mâché, except this wasn’t a silly prank. She clicked her tongue at the inconvenience and struggled into her dressing gown. Grabbing her stick, she proceeded to prod the corpse. It was little more than a decaying carcass of flesh and bones and fur, rather mangy fur at that. She looked at death and thought how unattractive the body was, even the body of a cat, once the spirit had departed. She felt little, just annoyance. She had so many cats she had lost count. They kept on appearing, though, in spite of the fact that she gave them little attention and certainly knew none of them by name. From where they came and why she hadn’t a clue, but they were drawn to her by a mysterious force. As Mrs Megalith was a gifted clairvoyant, this was commendable indeed. “Some years ago I spent an Easter holiday transfixed by a 3-part TV adaptation of a Rosamunde Pilcher novel. Cherishing as I do the memory of this televisual treat, I was delighted to discover that the SWALLOW AND THE HUMMINGBIRD presses many of the same buttons. Here again is the romantic windswept Cornish setting, the lovers parted by the cruel hand of war, the jolly younger sister, the coming to terms with terrible injury, plus a good many elements exclusive to Montefiore including a walnut-obsessed farmer and a witch. 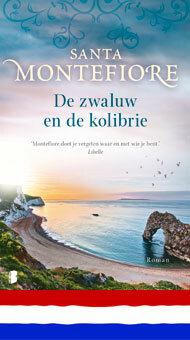 Montefiore, whose mother is part-Argentinian, usually manages to set some part of each novel in South America. Cue lots of sunshine and empanadas and also the icily beautiful. The novel displays all Montefiore’s hallmarks: glamorous scene-setting, memorable characters, and as always deliciously large helpings of yearning love and surging passion.